The CX3 is a versatile, great cornering TLR cyclocross tyre that excels in muddy soft conditions. It features Hard-Case Lite sub tread for puncture protection in a UCI legal size. 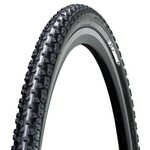 Kiss pinch flats goodbye with the Tubeless Ready CX3 Cyclocross tyre. Run lower tyre pressures and get traction performance that goes head-to-head with tubular tyres for a fraction of the cost.